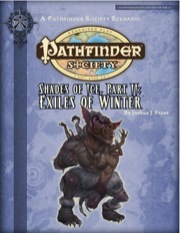 Join us November 8th at 2:00 pm at Hometown Hobbies in Huntington for #2-17: Shades of Ice—Part II: Exiles of Winter. This will be a continuation of the story from last week but anyone is free to join in. We will be finishing up the trilogy next week. This is for levels 1-5. Following the trail of the insidious Shadow Lodge from Trollheim to the icebound city of Whitethrone in the witch-ruled nation of Irrisen, the PCs must locate the hidden lodge of their contact’s kidnapper. Can they get past the city’s defenses, infiltrate the Shadow Lodge headquarters and rescue the Pathfinder Society’s valuable ally, or will they—like so many before them—find their bones ground to make Baba Yaga’s bread? Exiles of Winter is part two of the three-part Shades of Ice campaign arc. It follows Pathfinder Society Scenario #2-15: Shades of Ice—Part I: Written in Blood and concludes in Pathfinder Society Scenario #2-19: Shades of Ice—Part III: Keep of the Huscarl King.